Continuing with our Leeds Lifestyle Guest Blogs, this month we have the ultimate guide to the Leeds Bar scene courtesy of local blogger Jennie Lindehoff who moved to Leeds from Sweden eight years ago and blogs at Life Styled By Jennie including regular news on the Leeds bar and restaurant scene. 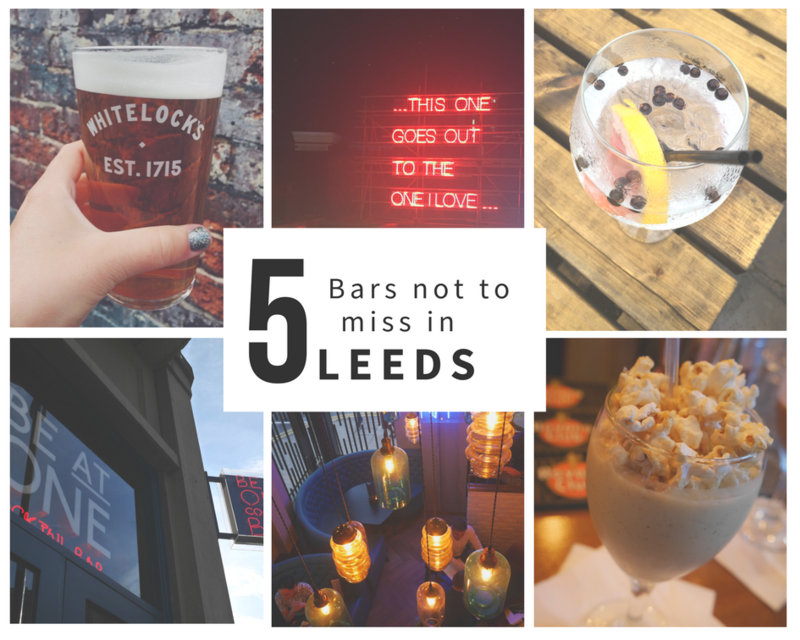 Here we have her take on the 5 top bars not to miss in Leeds…. Leeds is full of bars and pubs to go to for a nice drink. Yearly, festivals like Leeds Loves Cocktails and Cocktails in the City are hosted here to celebrate Leeds bar scene and talent. With so many drink holes around, it’s difficult to narrow them down to only five places to enjoy. The following list is good if you’re new to the scene and it has a mix of offerings depending on your preference. The Maven is located on upper Call Lane, next to the Leeds Kirkgate Market. It can be tricky to find if you haven’t been before as it’s not got a sign outside, it’s simply a black door. Once inside you’re met with beautiful tiled floor steps leading up to the main bar a la 1920’s style. It’s a dark bar serving delicious cocktails. Perfect for a quiet gathering on weeknights and a hustle and bustle during the weekend. 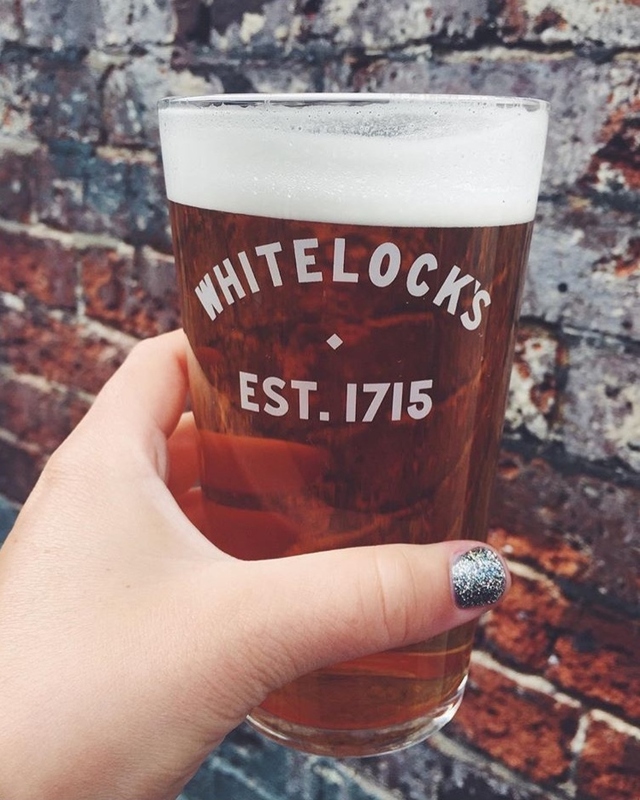 Leeds oldest pub, Whitelocks, established in 1700s is situated in one of Briggate’s alleyways. You can also access it on the opposite side, from the Pintura/Clarke’s entrance. This bar is always crammed so you need to pick a good time to get a seat. It’s only small indoors but the outside seating area is perfect on a warm day. This is not the place for fancy cocktails; it’s more the atmosphere that attracts. 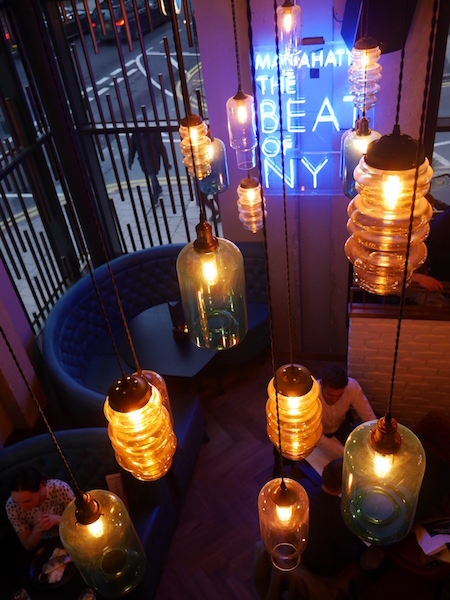 Be At One is the latest cocktail bar to open up in Leeds on Boar Lane. 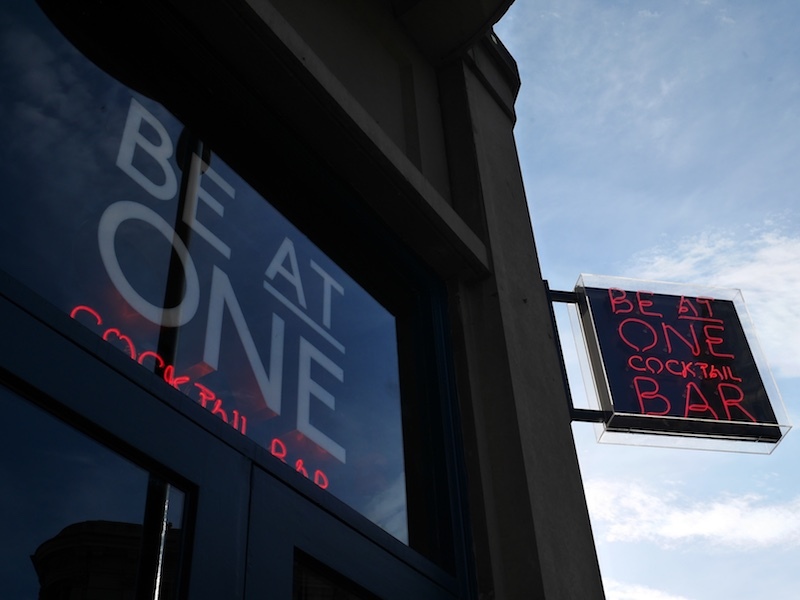 It’s the second Be At One bar in Leeds (also at Millenium Square) which shows its popularity. Their cocktail menu includes a 100 or so drinks, all cleverly marked by taste and spirit so if you for example know you like sweet gin based cocktails, their menu will easily find it for you. I can highly recommend their ice cream based cocktails, especially on warm summer days. This is a fun and lively bar to go to if you want to see the bartenders interact with the music and put on a comical act. 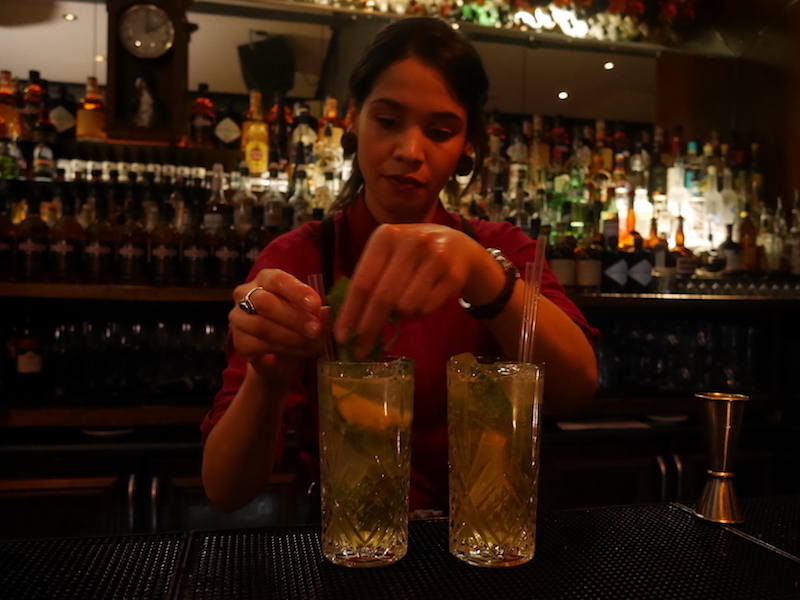 Like Be At One, Manahatta has two bars in Leeds: on Merrion Street and Greek Street. From the name you can tell it gets inspiration from New York and the interiors and cocktail menu second this. With the help of bartenders working at The Savoy in NY this cocktail menu includes drinks out of the ordinary with fun taste twists. Open from noon till later hours, you have time to try them all. If you prefer a more chilled and dare I say hip atmosphere, Headrow House on The Headrow is for you. It’s a three level venue with a bar on each floor, including a rooftop bar with its famous neon sign. When the sun is out, this place gets filled up quickly. I can highly recommend their gin menu and also their restaurant, Ox Club, serving one of the best brunches in town. For more bars and pubs in Leeds and a good way to keep up with all the latest ones launching, check out Leeds List for all the latest news, suggested hidden gems, and weekly ‘What’s On’ lists.